CHICAGO – In the context of history, and the way information is consumed these days, the Boston Marathon Bombing in 2013 seems both like yesterday and a long time ago. Director Peter Berg’s “Patriots Day” is the first film account of that horrid week, and features Mark Wahlberg. Wahlberg, along with Ben Affleck and Matt Damon, are the unofficial show biz mayors of Boston, and inspired a wicked parody by Seth Meyers called “Boston Accents.” The subject matter of “Patriot Days” creates an immunity towards commentary on the Boston accents in the movie, but there are still a few moments that are reminders (seriously, download that sketch on YouTube). Peter Berg (“Friday Night Lights”) is a yeoman director who tells a straightforward story, and succeeds in re-creating the events of that week without too much hyperbole. It was a frightening time for Boston and the country, but the results of many people doing incredible work wrapped up the case quickly and effectively – the film is a tribute to them. 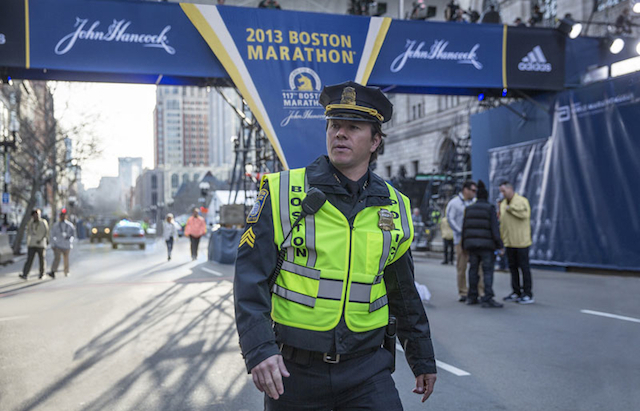 Tommy Saunders (Mark Wahlberg) is a Boston police homicide detective working on a suspension, and as part of his penance is assigned a uniform task (“I look like a crossing guard”) monitoring the finish line at the 2013 Boston Marathon. The infamous explosion occurs, and Tommy is right in the midst of it. Boston Police Commissioner Ed Davis (John Goodman) is soon on the scene. So begins the investigation of who did it, and the phone pictures and security camera images of the day are helpful in mobilizing the FBI, headed up by Richard DesLauriers (Kevin Bacon), with oversight by Governor Deval Patrick (Michael Beach), and aided nearby through Watertown police officer Jeffrey Pugliese (J.K. Simmons). It becomes apparent that it was two brothers who caused the bombings, Tamerian (Themo Melikidze) and Dzhokhar (Alex Wolff) Tsaraev. What is HollywoodChicago.com ESP? / Que es HollywoodChicago.com ESP?